We love the Aromatherapy Fanfuser for its ease of use and effectiveness. It's quiet and safe, which makes it a nice choice for retirement homes, galleries and stores. 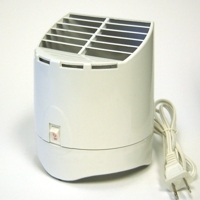 The Fan Fuser uses no heat and requires no candle or glass. To use, simply add a few drops of essential oil or aromatherapy blend to the replaceable pad, plug the Fan Fuser into any 110 volt wall outlet and flip the switch to high or low. You'll be surrounded with a gentle breeze that carries the aroma throughout the room. The Aromatherapy Fanfuser has high and low speeds, and unlike the nebulizer diffusers, works well with both thin and thick oils. You can also use several oils at the same time, mixing your own blend. This diffuser works well in a space up to around 500 square feet. Includes two fragrance pads. To purchase additional fragrance pads click here. Review: The fan fuser is amazing! It is helping me ease into a more restful sleep at night. Between the quiet white noise and the relaxing oils I am putting in it. As soon as I turn it on, I feel so relaxed and peaceful. I am considering buying another one for my office. Review: This is great. I use it all the time with my essential oils. The price was right too.